Increasingly seen as a requisite endeavor for businesses of all sizes, digital marketing promotes growth by getting products, services, and content in front of potential customers. Digital marketing encompasses multiple channels. In particular, SEO and paid advertising increase a business’ visibility and reputation online. 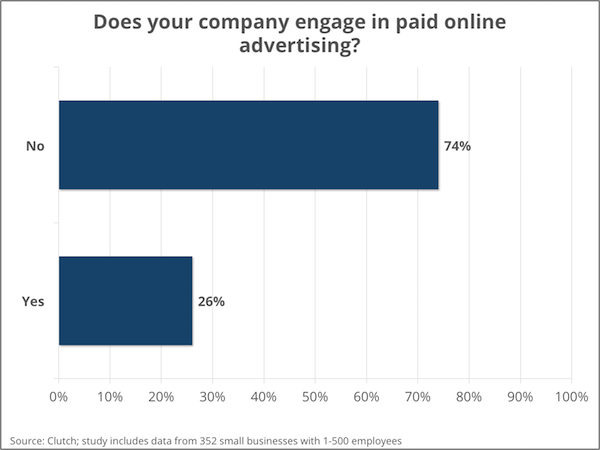 Clutch surveyed 352 owners and managers of small businesses in the US to determine how they use two core digital marketing channels: SEO and paid online advertising. 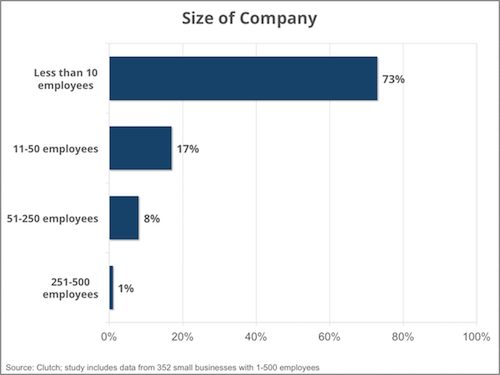 The majority of survey respondents are businesses with 1-10 employees and less than $1 million in annual revenue, which matches the makeup of the 2013 US Census Bureau data on small businesses. Half of small businesses in the US that maintain a company website do not engage in SEO, which lowers their odds of being found online. 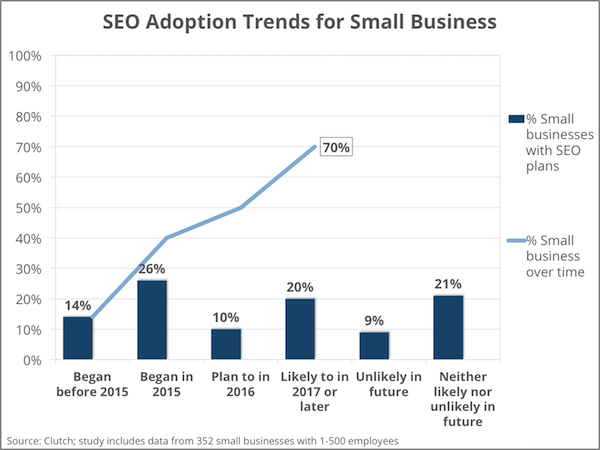 Low or nonexistent SEO engagement in the small business market may shift dramatically in a few years, with 60% of small businesses planning to implement an SEO strategy by 2017 or later. The cost associated with implementing an effective strategy is one reason why small businesses shy away from SEO and explains why only 34% of small businesses hire an SEO company to help them. Of the small businesses that currently do SEO, 57% focus on onsite optimization and local search optimization, while only 25% say they create quality content that earns links. Paid online advertising is another means of positioning a company website at the top of a search engine page. However, only 26% of small businesses use this digital marketing strategy. Before engaging in SEO, small businesses must have a website. Overall, 54 percent of respondents indicated that their small business has a website. Of this small subset, only half engage in SEO. This low engagement in SEO means that many small businesses leave the task of being found online to chance. — Duane Forrester, Vice President of Organic Search Operations, Bruce Clay, Inc.
SEO allows small businesses to take control of how search engines, potential customers, and existing customers perceive their products and services. 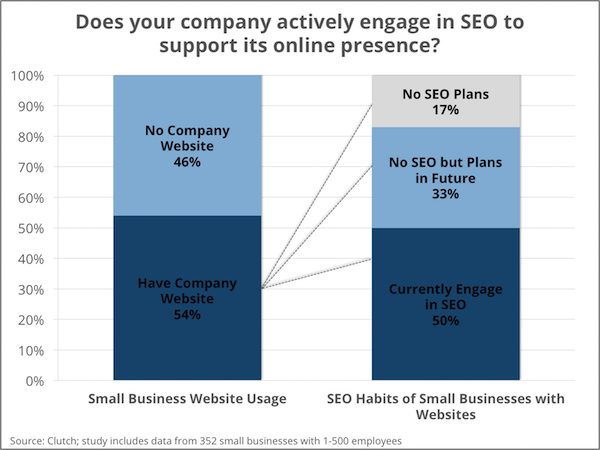 Small businesses that neglect SEO forgo these benefits. For example, a company that shows up high on a page in Google in response to a search query appears more authoritative. Despite the low level of SEO engagement at the time of the survey, small business awareness of and commitment to SEO has a bright future. While only 30 percent of all respondents indicated that they currently implement SEO strategies, by 2017, 60 percent of small businesses plan to practice this digital marketing strategy. Small businesses in the initial stages of planning an SEO strategy should heed three pieces of advice. 1.) Educate yourself about the basic SEO strategies and concepts. 2.) Work with a reliable, trustworthy SEO agency. 3.) Budget enough resources to sustain a long-term SEO strategy. 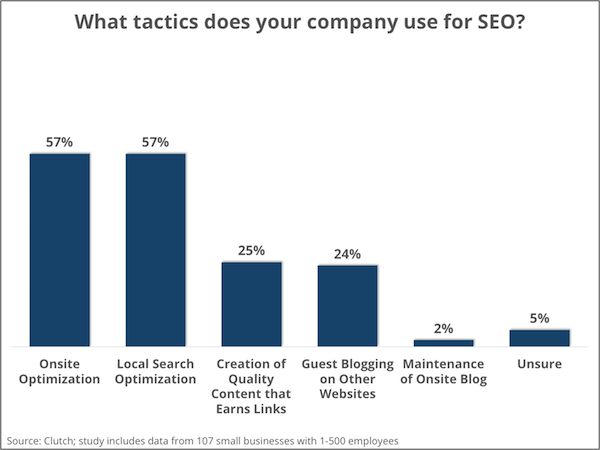 The SEO tactics small businesses employ most frequently are onsite optimization and local search optimization (57%). Industry leaders agreed that onsite optimization is a crucial SEO strategy. Overall, effective SEO requires a balanced, comprehensive approach. Three ways of diversifying SEO strategies stand out. Agency leaders emphasized the importance of creating quality content that earns links, a tactic only 25 percent of businesses use. Content enables a business to answer a potential customer’s questions, either through the content itself or through links to other relevant sources. This ability to provide helpful information fosters trust and signals that the business can anticipate a customer’s needs. Guest blogging on relevant websites with a high domain authority is another useful SEO strategy; yet only 24 percent of small businesses guest blog to improve SEO. Non-linked attributions also enhance SEO by fostering a positive association with the company. 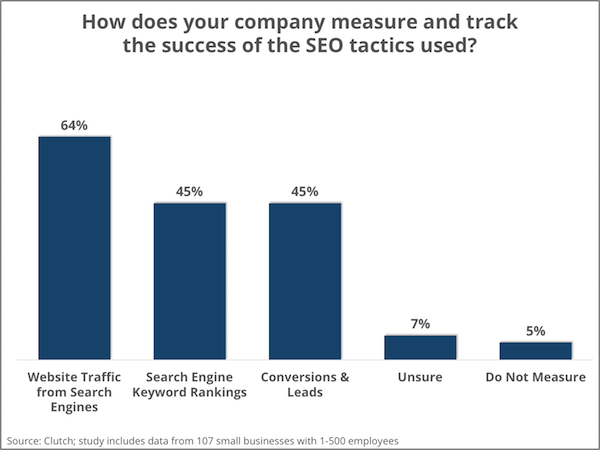 Gauging the effectiveness of SEO strategies requires tracking certain metrics. What metrics are most important to small businesses? 64 percent of small businesses measure the success of their SEO strategies by tracking website traffic from search engines. Other frequently used SEO metrics include tracking search engine keyword rankings (45%) and conversions and leads (45%). Despite the popularity of tracking keyword rankings, industry leaders pointed out that this metric has lost its relevancy. Industry leaders highlighted the importance of tracking metrics that relay information about the ROI of SEO, such as conversions and leads. However, it is important to remember that multiple factors influence the effectiveness of SEO lead generation, such as web design and user experience. 64 percent of small businesses rely on in-house knowledge and resources for SEO. The main benefit of hiring an SEO agency is the level of experience its consultants bring to the task. Working with an SEO agency can lower the learning curve for small businesses, as long as they make an effort to guarantee the transfer of knowledge. However, the process of selecting the right SEO agency remains unclear for many businesses. 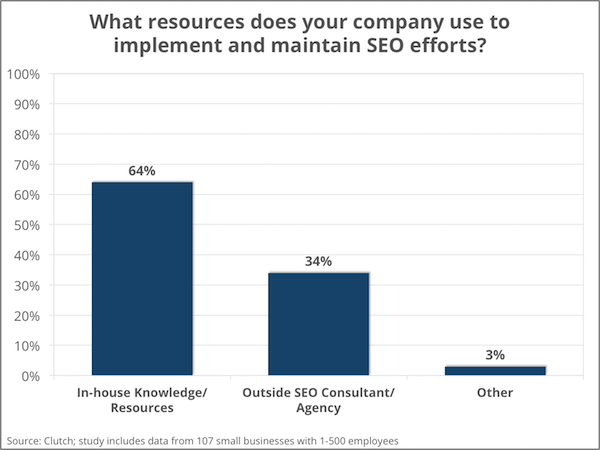 SEO experts advise businesses to focus on four factors: focus areas of expertise, past performance, company attributes, and value, according to a Clutch study about how to select an SEO company. Also, using an SEO Company Evaluation Tool can help businesses find an SEO service provider that meets their needs. 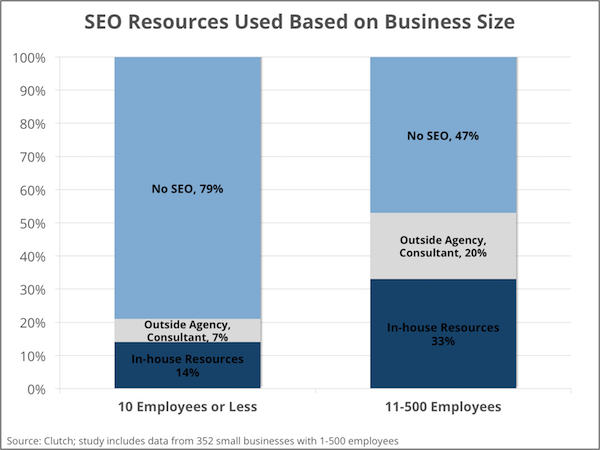 Breaking the data down by company size – 10 employees or less compared to 11 to 500 employees – reveals that mid-sized businesses are more likely to hire an external agency to help with SEO. 20 percent of businesses with 11 to 500 employees work with an SEO agency, compared to only 7 percent for businesses with 10 employees or less. Cost is the main factor that influences whether a small business works with an SEO agency or solely relies on in-house resources. For the small businesses that choose to rely on in-house SEO resources, Matthew Goulart advises creating a strong foundation before engaging in off-site activities. Other methods also exist to put a small business’ website at the top of the search engine page. Engaging in paid online advertising – which takes many forms, including pay-per-click (PPC), display, email, and social media advertising – is one means of diversifying website traffic channels. Only 26 percent of small businesses use paid online advertising as a digital marketing strategy. However, online advertising is on small businesses’ radar. 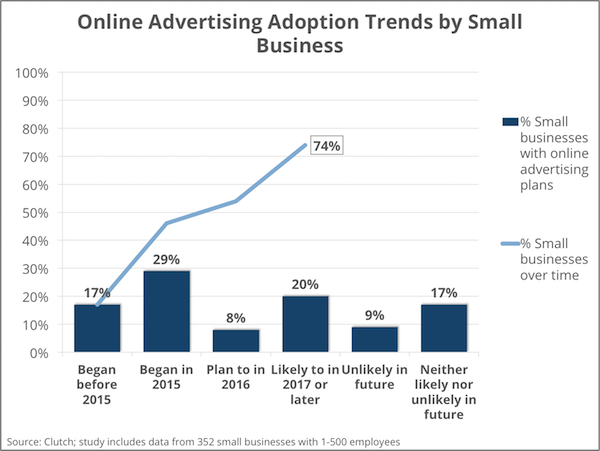 By 2017, 54 percent of small businesses plan to implement an online advertising strategy. David Szetela, vice president of search marketing operations at Bruce Clay, Inc., expressed surprise at the low level of engagement in online advertising. Online advertising benefits small businesses by enabling growth. On the other hand, the low participation in paid online advertising makes sense when considering the costs associated with this digital marketing channel. What rules guide the frequency of advertising online in the small business market? 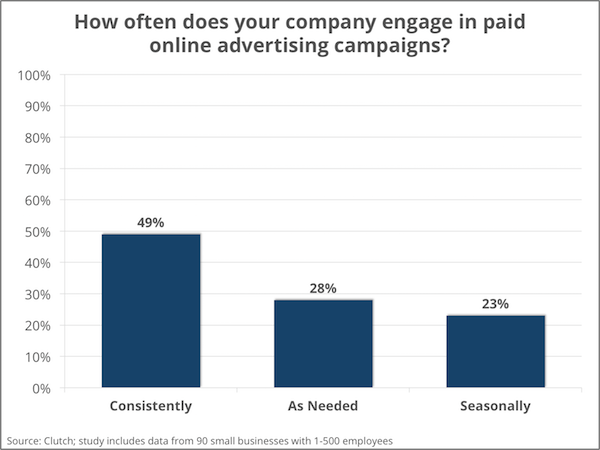 Of the small businesses that engage in online advertising, nearly half, 49 percent, advertise consistently. Advertising consistently improves a business’ chance of making a lasting impression on a potential customer. However, as with SEO, the type and frequency of online advertising depends on a business’ goals, budget, and advertising channel of choice. The study consisted of 352 owners or managers of small and medium businesses in the US. 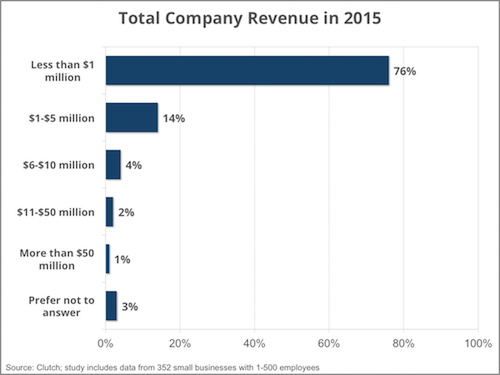 The majority of businesses, 73 percent have 1-10 employees and less than $1 million in annual revenue. According to the 2013 Census Bureau Statistics of US Businesses, nearly 80 percent of small businesses are composed of fewer than 10 employees, which matches our survey sample. The remaining businesses, 26 percent, have between 11 and 500 employees. The survey was conducted throughout January 2016.